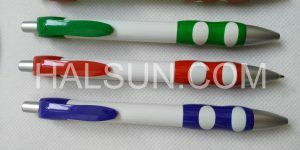 Flag Pen,Custom Flag pen,Marketing pen with pull out,pen with pull out for company gifts. Customized pen with pull out with roll out flags. 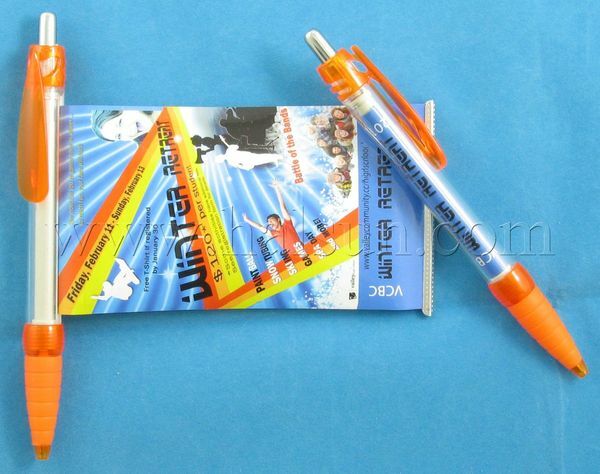 Pull Out Banner Message Pens. Free shipping to USA, West Euro, Australia. HSBANNER-9 is one of the best selling pen with pull out and with unique water drip clip and soft rubber grip. The pen with pull out with roll out flags HSBANNER-9 include a retractable paper flag with film coated to ensure durability. Your full colored advertisement picture can be printed on both sides of retractable flag size up to 180*68MM, which will impress all your target customers with your products or service. 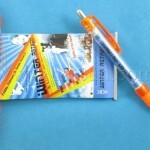 pen with pull out are a great way to create a lasting impression. With an eye-catching retractable banner housed inside a stylish pen, your message is sure to be kept handy and visible at all times. create excellent advertisement for any promotion idea. Need to convey a big message on your promotional item? This spring-loaded ballpoint pen includes a fully retractable poster that’s perfect for your marketing information. Your creative, full-color promotion is printed on the poster. Just send us your artwork or image, we will delivery the goods to your door in 4 weeks. 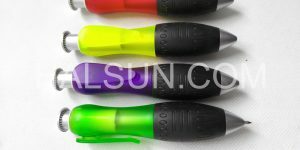 We’ve been professional Chinese manufacturer and direct seller of pen with pull outs for years. We’ve helped many companies to enhance their promotional program, distinguishing political candidates by giving away this unique and useful pen with pull outs to public. Supplement your banner stand displays with the perfect trade show promotional giveaway. Message pens! Our innovative retractable banner message pens leave a long-lasting impression on potential customers. Print your logo, company information and special offers on our personalized message pens! With message pens from Post-Up stand, your customers will take your brand with them everywhere they go. Find the perfect ones for your message today. Display your message inside a pen with pull out! Barrel colors: Blue, Black,White, Red, Purple, Green, Blue, Orange, Yellow and more. 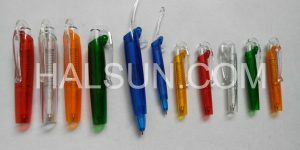 Flag Pen contain a spring loaded, laminated paper banner which self-retracts inside the barrel of the pen. Print your own message in colour on both sides of the scroll out banner. 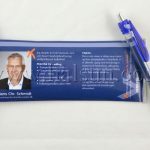 Unlike traditional giveaways that people swiftly forget about, the promotional brochure pen is something that will keep on selling, informing and educating your prospects for months. Each time they pull out the flag to show colleagues and friends, relevant information about your business, products or services will be displayed. Remember it is hard today to find a promotional product that really catches peoples attention but also has a useful function. 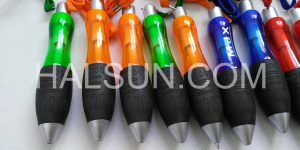 Importantly the flag Pen is an inexpensive option compared to many other promotional pens. So often companies spend money on giveaways that have no useful application. The Flag Pen is a product that will give you a good return on your promotional dollars. When marketing budgets are tight these pens, at around one dollar, are excellent value.
? Durability – built to last! Why pen with pull out? 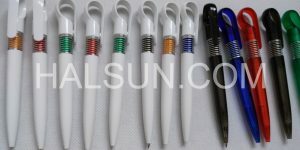 Scroll Banner Pens / pen with pull out are a novel idea that will make your next promotion unique, effective & fun. The simple scrolling design of the banner pen has an instant attraction to all who comes in conact with them. 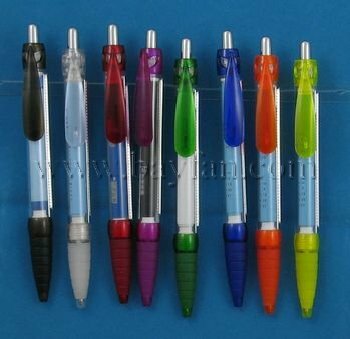 Add your choice of plastic pen colours and you’ve got a perfect match to your corprate look & style. 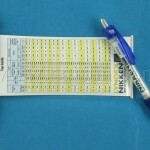 Scroll Banner Pens are available in a range of quantities and styles. Check all scroll out flag pen sytles here. 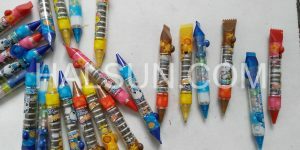 Scroll Banner Pens are also known as info pens, banner pens, scroll pens, pen with pull out, billboard pens, and are most often refered to as pull out pens. As most of the small quantity promotional gifts are for a certain comming event. Thus many orders need quick production and swift delivery. We launch the 15-days Urgent Orders Plan to enhance your events! 1. Delivery time. 15 days means time between the day we received your payment and the day the goods reach your door. And everything listed in following confirmations before production must be confirmed before 15 days start counts. 2. Price. Normally there will be 20% extra based on our open price list. Check price here. But need our further confirmation for specific region. 3. Express freight. Already included in open price list. 4. Payment Terms. T/T in advance. Usually there will be 2 business days for us to receive payment from main big USA and Euro banks. And 2-5 business days from South America and Africa. So make sure you made payment 2-3/2-5 business days before 15 days counts. And make sure use SWIFT. We can also accept paypal for small orders to speed up payment. Customized color for barrel is not workable for quantity less than 10,000pcs. 2. Ink color. Black or blue? 3. No logos on clip or barrel. This is to fasten production. As the barrel is transparent logo on paper banner will show clearly even the banner is not slided out. 4. Which one is the face side of your artwork. If your artwork printed on paper banner is vertical, specify which side is close to pen barrel when the paper banner is pull out. 5. Your detailed address to deliver scroll pens to. Post code, Telephone number, contact person. *1 This low price is based on certain quantity and delivery location. See details by clicking above order link.